Celebrities weren't the only ones shining on the red carpet. The 91st Academy Awards took place last night, where Hollywood's biggest celebrities walked down the red carpet wearing flashy suits and glitzy dresses with more sparkles than a jar of glitter in a flashlight factory. But the celebrities weren't the only ones grabbing the paparazzi's attention. As you may have seen during the red carpet event, Mercedes-Benz received some great exposure thanks to a well-placed AMG GT 4-Door. 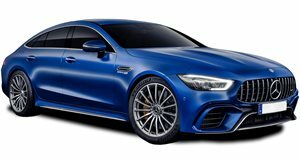 The AMG GT 4-Door is already an imposing vehicle with its aggressive styling and wide stature. The most potent GT 63 S version produces a whopping 630 horsepower from a 4.0-liter twin-turbo V8 engine, resulting in a 0-60 time of 3.1 seconds, and a 195 mph top speed. To ensure people wouldn't miss the car while it was sitting on the red carpet, the German marque had it wrapped in gold chrome. If you've never witnessed the process of how a car is wrapped, Mercedes shared a Behind-The-Scenes look at the car going from a stealthy grey to a glimmering gold. In addition to having the car photographed with a slew of A-listers (photo credit: @ontheredcarpet), Mercedes created a trio of movie posters featuring the AMG GT 4-Door. The first one shows the rear taillights of the car with the caption "you can't hide from the LED" for the fictional movie, 'Illumination.' The second is a romantic comedy called 'The Love Route,' featuring customizable seat configuration in collaboration with premium leather. The final fake poster depicts a science fiction movie called 'Infinite Space,' which brings "a new dimension of leg room."